Slip, hbk, 3 vols, 9.75 x 12.5 in. / 216 pgs / 90 color. This publication traces the arc of Hudson Valley–based artist Tanya Marcuse’s (born 1964) work over a 15-year period. Fueled by the Biblical narrative of the fall from Eden, these projects use fantastical imagery to explore cycles of growth and decay and the dynamic tension between the passage of time and the photographic medium. 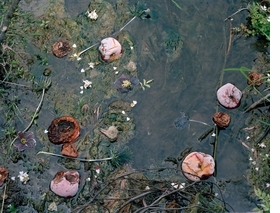 The first volume, Fruitless (2005–10), features serial photographs of fruit trees near Marcuse’s home in the Hudson Valley. Repeatedly photographing particular trees from the same vantage point, Marcuse catalogs seasonal transformations; the fallen apples become more prominent as the work progresses. In the second volume, Fallen (2010–15), Marcuse imagines the landscape of ruin in Eden after the exile of Adam and Eve. Using fruit collected from beneath the trees of Fruitless, Marcuse depicts an ordered paradise becoming wild and untended. 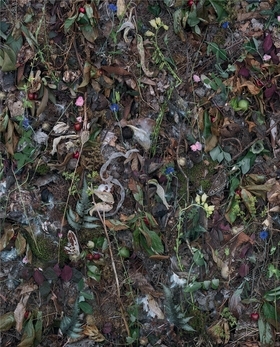 Volume three, Woven (2015–19), takes Fallen’s dense arrangements of flora and fauna to a newly immersive scale, with 5-by-10-foot tableaux that converse with medieval millefleur tapestries. These exquisitely detailed photographs evoke a Boschian world of allegory and fable. FORMAT: Slip, hbk, 3 vols, 9.75 x 12.5 in. / 216 pgs / 90 color.